On October 1, 1892, George B. Bassett established the Buffalo Meter Company in order to manufacture water meters from his own patents. In 1915, growth of the company facilitated the need for a new building to house operations. The company enlisted the nationally prominent firm of Lockwood, Greene & Co., based in Boston, Massachusetts, a firm also known for their role in designing Buffalo's Pierce Arrow Factory and the Larkin Exchange building. Construction of the new Buffalo Meter Company Building was completed in 1917. 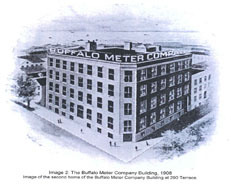 Housed in their new facility on Main Street, the Buffalo Meter Company continued to be one of the nation's most prominent makers of liquid meters during the first half of the twentieth-century. Originally, the company located their main offices and shipping on the first floor, the Machine Shop and Assembling on the second, another Machine Shop and tool room on the third floor and the brass foundry on the fourth floor. In 1969 or 1970, the Buffalo Meter Company left the Main Street building because their multi-level manufacturing facility was outdated. On May 27, 1971 the former Buffalo Meter Company Building was purchased by the University at Buffalo. Beginning in 1973, the building was used by the University to house the Department of Art, the Architecture Department and also portions of the Division of Continuing Education. It was renamed as the Louise Blanchard Bethune Hall, after the first professional woman architect and the first woman fellow of the American Institute of Architects. The building had a role in the 1983 movie "The Natural" starring Robert Redford; it was one of many Buffalo-area buildings and sites filmed for the movie and was used as a stand-in as an early 1900s industrial building. By 1994, the University had vacated the former Buffalo Meter Company Building, and the building was auctioned in July of 2005 by the State of New York. It was purchased by a Ciminelli led partnership in 2010. The Buffalo Meter Company Building has been added to the State and National Registers of Historic Places as an excellent, intact example of a daylight factory in the City of Buffalo. We celebrate the history of Bethune Lofts as will be evident throughout the building, and are proud to share its adaptive re-use with the entire City of Buffalo.